It has been a while since the indie games industry started blooming again, giving birth to all sorts of games, both in already known but also new genres. Many indie developer studios still aim to please the gaming audiences by making even more refined experiences of gameplay styles that most players might already be accustomed to. This is also the case for The Good Mood Creators studio who bring us a classic platformer experience through Mekazoo. Just a few seconds into the game and I already felt the nostalgia hitting hard. I may not be old enough to have tried games on the Atari but I did get to finish all the Donkey Kong Country games as well as a bunch of other classic platformers of that time, so I can tell you that the feel of Mekazoo is very much in the vein of those games. I feel it is safe to even say that this is exactly what the developers wanted to do with the game while developing it. Throughout the game, we have control of the Mekanimals (five different in total) that all have different abilities which help with traversing the platforming challenges that we find through each level. We start off with one animal and slowly progress to unlock all of them. A very fun to use platforming mechanic that was also amplified by the good level design that made us keep a constant momentum, almost Sonic-like. Rolling all over the place and changing animal form in order to keep the momentum going is more fun that I expected it to be. I would be a fool not to tell you about the multiplayer mode though. Just like most games, it aspires to have good multiplayer and unlike most other indie games, the co-op mode is actually good and interesting. I say unlike most others because the multiplayer in indie games is usually a little bit lackluster because developers tend to overlook it and just leave it as simple as it can be. 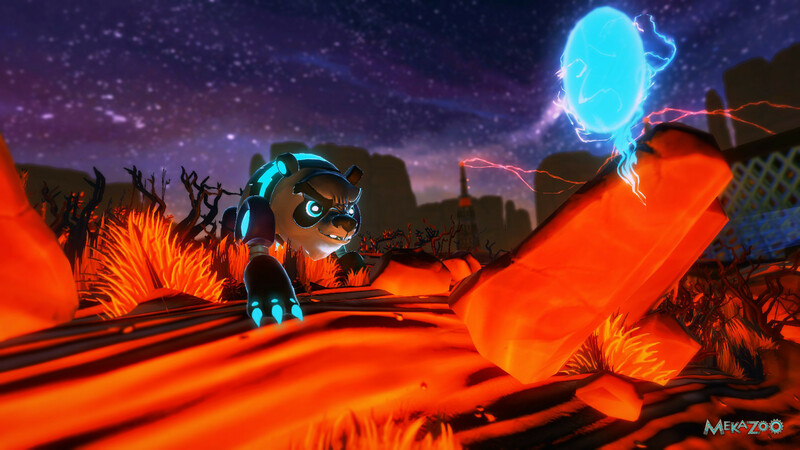 In Mekazoo though, each player will have to push a button to change form when needed and control different animals than their partner. This creates a co-op experience that relies on communication and smart timing button pressing from each player. It is pretty great and I recommend you try it, even more than I would recommend playing the single player. Oh, did I mention you should play this with a controller? Because you totally should, since the game is experienced to its fullest when played with a controller rather with the keyboard. Same case as with most platformers, but worth mentioning that Controllers are well received by this game with no problems whatsoever. The visuals of the game basically speak for themselves and make up for the nostalgic platformer experience that I mentioned earlier. A 2.5D environment so well done that sometimes you forget that you only move in 2D directions. Neon colors light up all of the worlds with a brightness sufficient enough to not start being annoying after long time periods of gaming. The models of both the Mekanimals and the enemies that we find in the stages are all quite detailed, and even though we do not really get to see them up close enough because of the general speed the game has, they blend nicely with the rest of the look of the game. 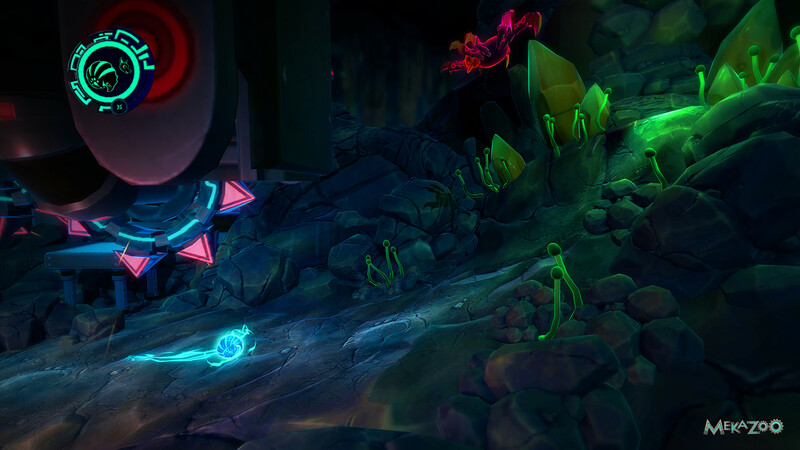 In a platformer, be it fast or slow, you need a clear view of what is going on and Mekazoo achieves that perfectly with a fine balance and contrast between the background environment and the enemies. The blast from the past experience though is also very much enhanced by the sounds in the game. With the excellent soundtrack that it, made by M.J. Quigley, we get the full experience of the platforming frenzy that goes down in Mekazoo. Mekazoo is available on Steam for 19,99€. The way I would describe Mekazoo in just a few words would be that it is a classic platformer with good looks and an interesting gameplay gimmick. Apart from that, it is definitely an experience with a lot of nostalgia infused in it. If you are a fan of platformer games then this is definitely one that should be in your library. Also, a must buy if you are looking for a good co-op game to add to your list of games that you want to play with others. Its price sets it a little bit back, but still a game worth checking out.